Moderate drinking seems to benefit the heart and cardiovascular system, but heavy drinking damages your heart and is a major cause of death in many countries. 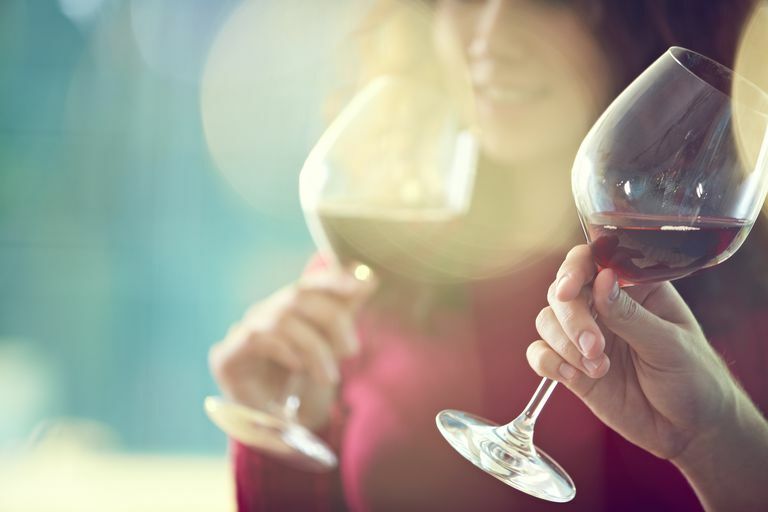 Studies show moderate drinking may raise high-density lipoprotein (HDL), sometimes called “good” cholesterol and may decrease low-density lipoprotein (LDL), sometimes called "bad” cholesterol, but doesn't seem to decrease triglycerides. “Moderate consumption” consists of one to two alcoholic drinks per day for healthy men and one alcoholic drink per day for healthy women. One drink is equivalent to 12 ounces of beer or 5 ounces of wine. Ethanol is the active ingredient in alcohol and affects more than just cholesterol. This molecule also directly influences organs in your body, including the heart, brain, and stomach. Moderate drinking elevates the "good" cholesterol, which increases your protection against heart disease. Current studies reveal that HDL levels can increase by up to 12% in people who drink between one to two alcoholic beverages per day. When cholesterol and other substances form in the walls of your arteries, it restricts blood flow and may eventually cause chest pain and a heart attack. The health benefits of moderate drinking go beyond cardiovascular. Data from large cohort studies found moderate drinkers are less likely to have gallstones and type 2 diabetes than non-drinkers. Moderation is critical. A meta-analysis following more than 365,000 people over 12 years found heavy drinkers consuming four drinks or more per day had no observable benefit. Which Alcoholic Beverages Have the Most Health Benefits? Actually, how you drink your alcohol is more important than the particular alcoholic beverage you choose. One drink per day does not have the same health implications as drinking all seven drinks in one night. When it comes to having a heart attack, the cohort data shows you are at greater risk for myocardial infarction if you consume alcohol at least 3 or 4 days per week. Some evidence shows a link between genetics and the cardiovascular benefits of moderate alcohol consumption. There are two variations of an enzyme that breaks down alcohol in your body. One does it quickly and the other more slowly. If you are a moderate drinker with two copies of the slow-acting enzyme gene, you have a much lower risk of developing cardiovascular disease than those who drink the same amount but have two copies of the fast-acting enzyme gene. Individuals with one of each fall somewhere in the middle. If you're thinking of taking up drinking for good health, look before you leap. Alcohol may increase the risk of breast cancer by up to 41 percent. That number doesn't translate into 41 percent of women who drink alcoholic beverages regularly will get breast cancer. It does mean it's a risk you should take into consideration. Kloner RA, Rezkalla SH. To drink or not to drink? That is the question. Circulation. 2007 Sep 11;116(11):1306-17. Powers E, Saultz J, Hamilton A, et al. Clinical inquiries. Which lifestyle interventions effectively lower LDL cholesterol? J Fam Pract. 2007 Jun;56(6):483-5. Which Nuts Help Lower Your Risk for Heart Disease? Anacetrapib for Increasing HDL—New Hope for CETP Inhibitors?